Mt. 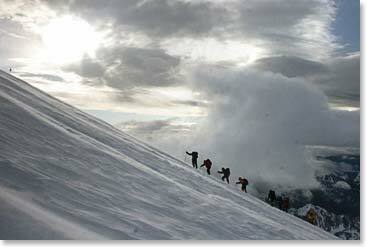 Elbrus Expedition Dispatch: July 8, 2014 – The Whole Team Stands on the Summit of Mount Elbrus! It’s 3:45 in the morning and the snowcat just pulled up to our Barrel and here we go, this is going to be our summit day! It was still snowing when we had our early dinner last night. At midnight Karina, Vladimir and I had agreed to get up. We woke up and stuck our heads outside of the Barrel and it was snowing. It was virtually a blizzard; it was coming down really hard. We called the snowcat driver after we checked the weather report one more time and told him to come ahead and meet us at 4am. Our weather forecast showed it was going to clear at about 1 am and indeed apparently it did that. Just after two the entire group was up. Leila had a great breakfast on. We have slowly been getting ourselves packed and dressed. The crampons are just going on now. 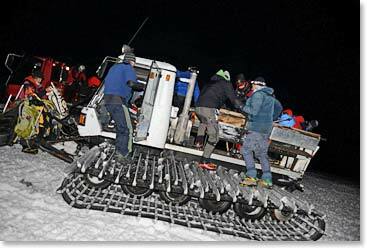 We will load onto this snowcat wearing our crampons. Here we go. First step, ride the snowcat back to the top of Paushtukov rocks. It’s a beautiful morning in the Caucasus’ I think the weather is changed and it is going to be on our side today. We will keep you posted as we climb towards the summit. Well we saw it all on Mount Elbrus today! As you can see from the summit photo it was glorious. It was perfectly beautiful. It was clear when we were on the top. I told you the story about the unsettled weather in the evening last night right up until about midnight and then how good it was when we started. I’ll have to say though, as often is the case on Elbrus, we saw some wind when we were climbing up into the saddle at 5,300m. It was a beautiful summit however. The entire team did great! 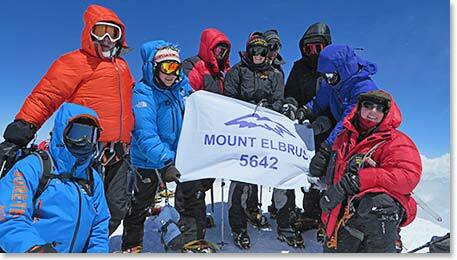 Our 2014 summit team on the top of Mount Elbrus. Congratulations!! Now on the descent it was welcome back to Mount Elbrus. We lost our visibility, had a lot of clouds and blowing snow. Now that we have returned to the Barrel’s it is snowing, something we are familiar with. But what a warm kitchen Leila has waiting for us. We are sitting around here and the team is very tired and they should be. They have had a really long day. It was 12 hours exactly from when the snowcat left at 4 am this morning and until we returned at 4 pm. We are going to send you some more photos from our Elbrus climb. And remember we are here in the Caucasus Mountains for two more nights. So we are looking forward to good times with friends and enjoying one of the great mountain areas of the world. So we will be continuing to send photos and stories of our adventures!